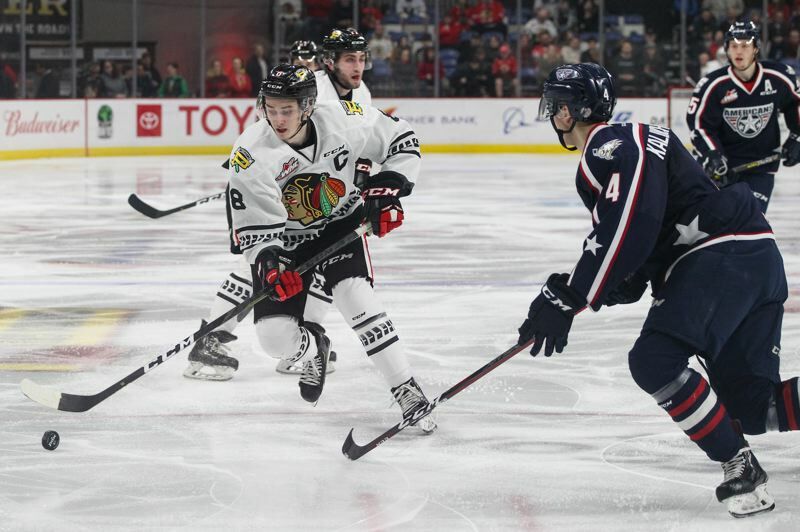 The Portland Winterhawks are playing good hockey, having won 10 of their last 12 games to stay visible in Everett's rear-view mirror. But the best development over the two-win weekend was the condition of Cody Glass' left knee. Winterhawks VP/GM/coach Mike Johnston on Monday said that Glass had begun the rehabilitation process. While there is no timetable for his return, he does not need surgery and will play again this season. That diagnosis is a relief for the Winterhawks and their fans. Glass, a top prospect for the NHL's Vegas Golden Knights, had his left leg twist awkwardly under him when Seattle's Tyler Carpendale fell onto him while Glass — with his right knee on the ice and left leg extended — was trying to shoot. It was not a dirty play, just an unfortunate one for Glass. Glass spent his Sunday seeing doctors and undergoing an MRI and X-rays of his left knee before watching Portland's 3-0 win over Lethbridge at Memorial Coliseum, standing and using one crutch to move around. After that game, Johnston was not ready to provide an update on the status of Glass and turned his postgame comments to the success his team has had without its captain in the lineup, pointing to the 5-4 record (with three of the losses in overtime) while the 6-2, 185-pounder from Winnipeg was away for the World Juniors tournament. "If he happens to be out of the lineup for a little bit here, then we're used to that," Johnston said. "We showed (Sunday against Lethbridge) we're adaptable. Every team that's going to have a chance has got to be flexible. If a guy's out of the lineup, you can adjust." The Hawks certainly have pluses: skilled youngsters, the league's top goal scorer in Joachim Blichfeld, an improving defense and a proven coaching staff. But if they don't have a healthy Glass, it's hard to imagine them making a deep run in the Western Hockey League playoffs. As Blichfeld, who has thrived alongside the Vegas Golden Knights' high-end prospect, said: "He's an all-around player. I have no doubt that he's going to be an NHL star some day. His vision is huge. He can skate it, and he can pass. "You never want to see a guy go down like that. He's a real key guy for our team," Blichfeld added. "Other guys just have to step up in the games he's not in." That happened Sunday against Lethbridge, when Portland's Joel Hofer produced the kind of effort in goal that a team can build a playoff run around. The 6-3, 155-pound native of Winnipeg stopped 37 shots in his first shutout — which could have been his third in five starts for Portland if not for goals in the closing seconds of a Jan. 19 game against Everett and in Saturday's overtime win over Seattle. "He's an elite goaltender. He showed that (Sunday)," Blichfeld says. "He's been lights out for us." Winterhawks associate head coach Kyle Gustafson, who coaches the defense, said Hofer and his new teammates are still adjusting to one another. That means learning the team's systems and how defensemen play. For Hofer, who led the league in shots faced (more than 40 a game) while playing for Swift Current, the 37 shots he stopped against Lethbridge were the most he's faced since joining the Hawks after they traded for him this month. "Tonight we were a little bit sloppy in front of him and gave up almost 40 shots," Gustafson said Sunday. "Usually it's going to be 25 to 30 shots and sometimes in a period you might only see five and you've got to keep yourself in it mentally. It's a big deal." • The Winterhawks should soon get another key player back. Defenseman John Ludvig, whose plus-28 rating leads the team by a wide margin, could return to the lineup by the weekend. The 18-year-old missed all three games last week with an upper-body injury, but Johnston on Sunday said Ludvig — 6-1 and 200 pounds — was skating hard and "a game or two away" from making a return to game ice. Portland plays host to Vancouver at 7 p.m. Friday and Spokane at 6 p.m. Sunday (both in the coliseum). • One thing missing from the recent run of form for the Hawks is their power play. Once among the best in the league, Portland was 1 for 27 in the five recent home games, with the only successful power play a two-man advantage. "We've got to fix that," Johnston said. Added Blichfeld, "We've just got to keep trying, and hopefully soon we'll get one. We look at video after every game. It's not like we don't get the chances ... it's just that we don't bury them."